Environmental issues are evident, as to the sign of dying trees. This is the direct result of the water war that exists between Israel and the West Bank. 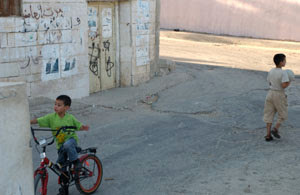 Water is scarce for the Palestinians due to no access to the local wells. 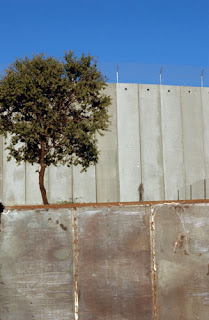 The wells have been included into the Israeli side of the wall for Israeli use, excluding the Palestinians. This land above is in Adyah camp, and has about 20 trees. However they are now dying, because they cannot have access to the water that was/is on their land. 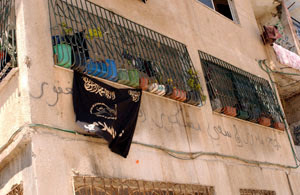 This is a home in Idyah camp, the flag is that of someone who was killed by the Israelis. 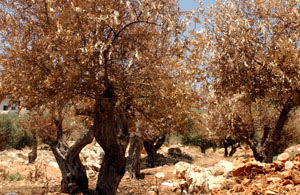 An olive tree in the cemetery that is located near the wall. There is not any room for growth. 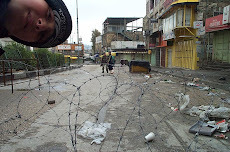 Boys playing in the camp just outside of the community center. The wall is in the background. Bara'a and Sanaa with their children. They are holding the bags for the photos that I provided. Bara'a, her mother and Sanna during the meeting.